At times, my day job and my propensity for fashion are at odds with each other. To be taken seriously as a lawyer, I feel the pressure and the need to dress like one. And yet, I spend almost all of my free time living, breathing, and pleasuring in fashion freedom. Sure, it would be easy to have two separate wardrobes-one for business and one for everything else but that would be a fashion cope out. Instead, I find creative, simple, and time savings way to transition my day looks to play looks so that I'm taken seriously at work and I don't have to sacrifice my serious passion for fashion. For my day in the office look, I'm wearing a Gypy05 floral blouse layered with a Brandy Melvile striped cropped shirt. A tea length Trina Turk skirt and floral printed mule sandals from Shoedazzle completes the look. It's ladylike, work appropriate, but still reveals elements of style personality and fashion trends. If your curiosity strikes, please check out my Youtube video to see how I take this outfit from the office to the Coachella desert in just a few easy steps. You are one sophisticated lawyer! You look amazing :) Love this work appropriate look! Talk to me about those shoes!!! You look amazing! I love the way you style the whole outfit; it looks professional yand classy yet fashionable at the same time. Awesome! Both looks are gorgeous and so different even if the originate from the same base, well done. I changed jobs because I didn't want to wear corporate clothes, well not really, but I wanted to be more free. You solved it perfectly. wow, that´s so nice. I love it. I like to follow you! Love the whole outfit! You look elegant, lovely and timeless! You posted on my blog saying "I love your style" but it wasn't a style post!! Guess you like my blog? 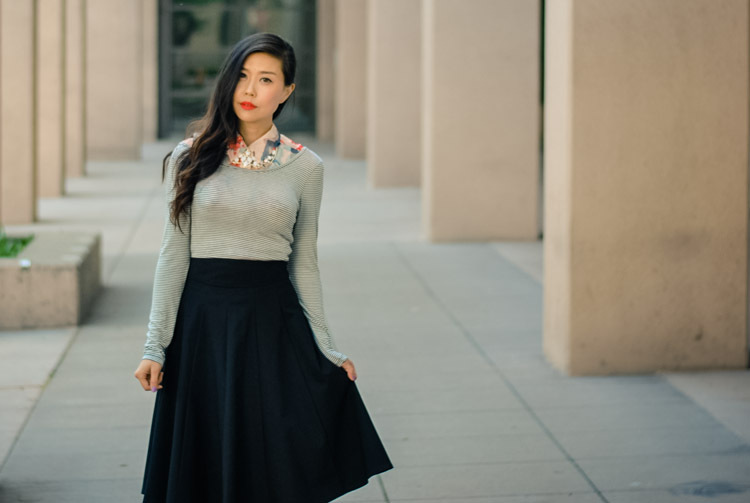 Oh well, I love this outfit post, the style of that skirt is so on trend right now! Love the shoes :)!! Visit http://urbanfashionstylee.blogspot.com and check my new post!! thank you very much for sweet comment on my blog!! :) you are soo beautiful.. I love your lipstick.. and also shoes and necklace are perfect! Wow!! You are really pretty!! Love your post and your blog! I follow you by blogloving, do you want follow me? Love that skirt! Wish I had a taller stature so that i could pull skirts like this off! Very stylish look! Love your blog !! Would you like to fallow each other with bloglovin? Amazing outfit dear! love the shoes! I LOVED the video! It's so great to see and hear you speak and interact instead of just reading your blog everyday. I hope you have a blast at Coachella this year! Love how you dressed up that sweater! Wow! Love your floral shoes, and the whole look, what can say? STYLE! She looks outstanding!! amazing personality. i also would like adopte this style.